1. Create an inviting presence that draws visitors in and invites them to linger and learn. 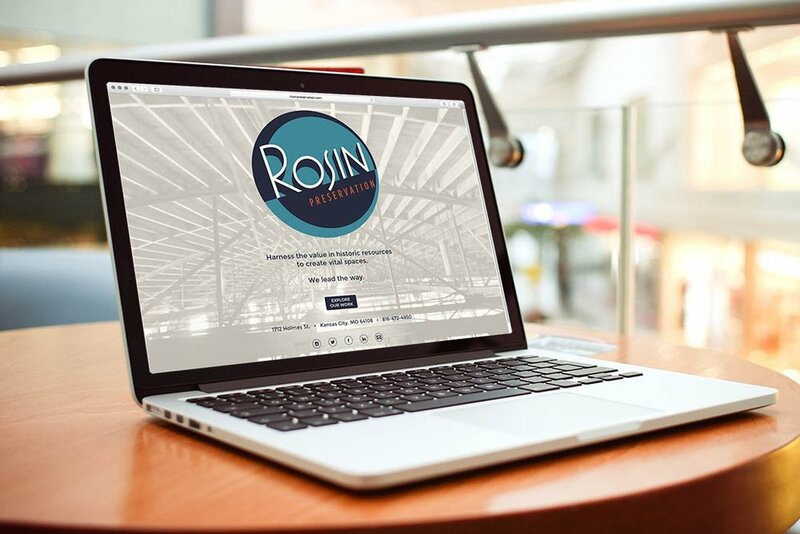 Rosin Preservation advocates for the maintenance, use and rehabilitation of the built environment. Much to their credit, they've walked the walk, redeveloping their own historic property in Kansas City's East Crossroads. The expression of that authority starts on their website’s front-door landing page, graced by a gorgeous photo of one of the building’s most dramatic features: its fully exposed, metal-trussed barrel-vault ceiling. Muted tones and natural lighting artfully celebrate the beautiful bones of their historic space and provide a meaningful backdrop for the company's logo and welcome message. There are no distractions on the page, not even a navigation bar. Instead, there’s simply an elegant invitation to enter the site and explore the firm’s work. 2. Establish the firm as a powerful influence, in their industry, throughout the U.S. Inspired by pins on travel maps, we created an interactive map to showcase the firm’s projects throughout the country. Projects are filtered by category — tax credits, National Register and so on — and feature building and site photographs, year of completion and case studies. Zoom out and visitors will see that the company has managed projects stretching from western Colorado to the Empire State Building! While the interactive map offers ample evidence of the breadth and depth of the company’s expertise, we needed supporting pages to share details about the people who make it all work and the specific services they offer. To that end, we built out pages including staff bios, blog posts and media mentions, each one crafted to support the overarching website goals. The happy result: triple the web traffic on the new site! Undertaking a brand uplift and launching a full website redesign are demanding projects, but they're not an end in themselves. To reap the benefits, businesses need to promote these efforts. To that end, we’ll write next week about public relations.